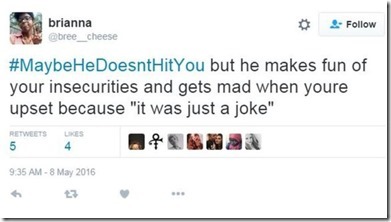 The hashtag MaybeHeDoesn’tHitYou was started by Afro-Latina artist and writer Zahira Kelly to raise awareness of abuse that isn’t physical or visible. 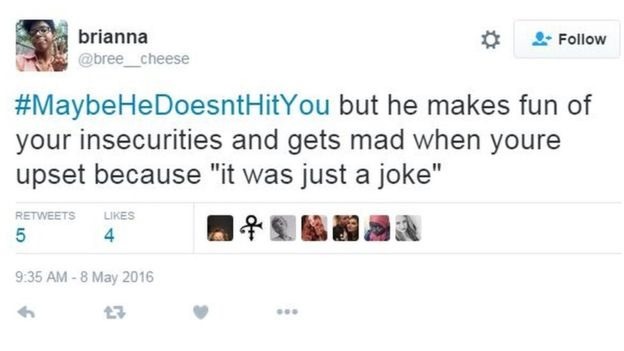 From there, hundreds of women shared their stories of abuse online. 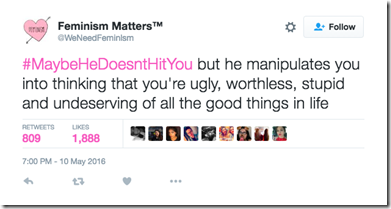 This hashtag became a powerful means to highlight accounts of verbal abuse, control, and manipulation—revealing that there doesn’t have to be physical violence for a relationship to be abusive. 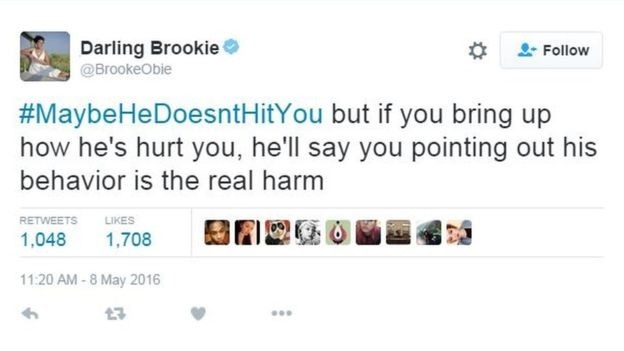 Even though this hashtag is now a couple weeks old and time moves fast on the internet, I wanted to bring this up today. I went to a local bookshop last night to look for summer reads and as I approached the cashier to buy a book, I overheard her talking to her coworker. The rest of the conversation was a little hazy because I was listening from afar and not actually invited into the conversation. 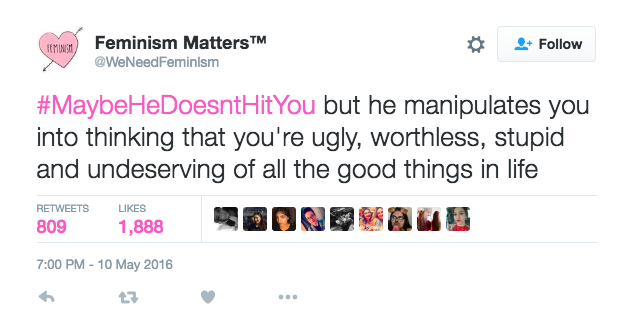 If this hashtag reveals anything, it reveals the scary reality of emotional abuse and manipulation and how common it is. 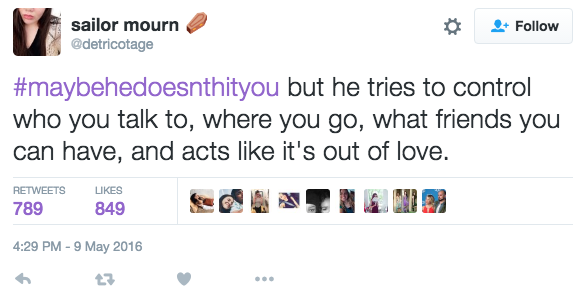 It also reveals how difficult it is to recognize given the very narrow healthy vs. unhealthy relationship narratives we’re given. 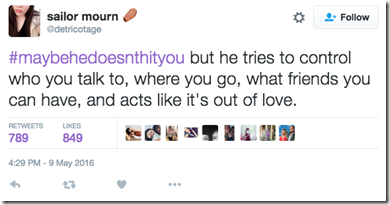 We need to move beyond the “well, there isn’t physical violence” narrative as a means to recognize a harmful relationship. We need to move beyond ideas like “boys will be boys,” and “that’s just how things are.” The hashtag challenges this normalization and opens our minds to the fact that other forms of abuse—emotional manipulation, humiliation, control of who you can see and what you can do—to name a few. That’s why we need to have these conversations. I think this is where the internet and social media come in as an ideal platform to start a dialogue on this. Like the woman I overheard in the bookstore, this hashtag struck a chord with many people, including myself. In the moment, it can sometimes be difficult to label and recognize your experience for what it is. Especially given that our relationships take place within a context and a culture that downplays and normalizes bad relationships and problematic behaviors. That’s why this is important. These are real stories and experiences and we need to make sure we listen to them and know that this is not okay. Need support? 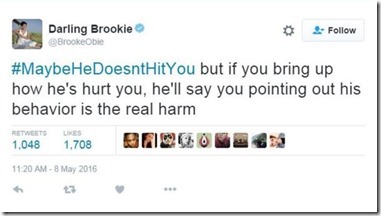 Call the National Domestic Violence Hotline at 1-800-799-SAFE (7233). The layout of the magazine. Image Source. The underlying premise: it’s never too early to teach young girls that their value comes from their bodies. With lines like, “Find the perfect suit for your body type,” the message that can be discerned here is: only certain bodies deserve to be seen. It also sets up the idea that there are rules for how girls should present their bodies. Have a curvy body? According to the spread, you better get yourself a one-piece. Let’s pause here for a moment. Who exactly is looking at these girls and why are these girls being painted as spectacles to be looked at in the first place? The implication here is that girls’ bodies are inherently sexual and there to be gazed at. If we really want to help boost confidence in girls, then we can’t perpetuate narratives that their worth and self-esteem should rest in how they look to others, and in how desirable they are. Let’s not forget the message that your confidence is inherently linked to what you wear and all it takes to feel confident in your body is finding the right swimsuit. The idea that happiness and feeling good about yourself are rooted in your appearance is a capitalist invention that many industries profit off of. And it doesn’t even work. 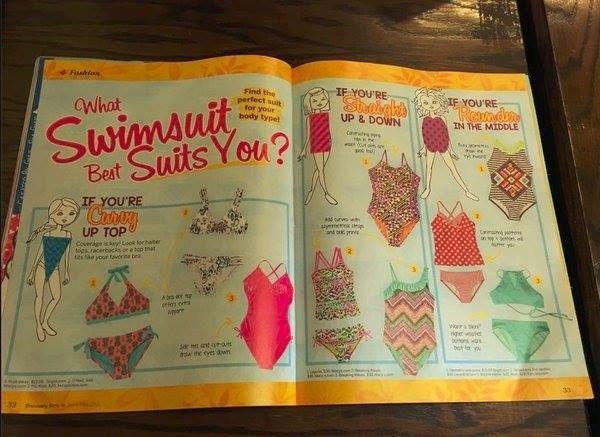 The angry response to the swimsuit feature led the Discovery Girls publisher to post an open letter acknowledging their mistake on Facebook. 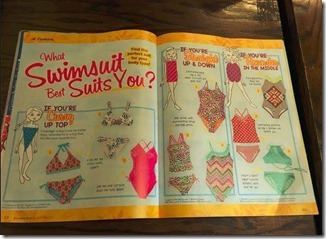 I appreciate the response and the acknowledgement, but why does it take a swimsuit for a young girl to feel confident? Why does her confidence have to come from her appearance and her clothes? We have to remember that there wouldn’t be a similar article in a magazine targeted towards boys about what to wear to feel confident. In fact, we don’t feel the need to teach boys confidence at all. So why do we teach girls to gain confidence through their looks? Let’s look at the issue with this feature intersectionally now. Bikinis and swimsuits—we are told by the media—are for thin, able-bodied, and conventional bodies that are almost always modeled by white women. So for women and girls who live in unconventional bodies, it can be incredibly difficult—if not impossible— to feel good in a swimsuit. That’s why this equation for confidence is not nearly enough. This does nothing but reinforce the status quo—operating under the thin ideal and norms about bodies. I’ll admit it, I’ve fallen into this trap myself. I’ve written on this very blog about how I’ve grown to feel comfortable in my unconventional body wearing sports bras out in public and bikinis on the beach. But why is that what it took for me to stop feeling so bad about myself? But you should know that I didn’t wear a bikini when I was nine. I already thought I didn’t have the right body type for it. So what about those girls? Where should their confidence come from? Simply wearing the “right” thing won’t fix anything, it won’t suddenly boost self-esteem and it rests in the notion women are inherently insecure. So let’s redefine how we teach body acceptance and confidence. Let’s teach young girls that you can like how you look and wear what you want regardless of whether or not it is “perfect for your body type” because that does not define you. Let’s teach young girls that feeling good about oneself can come from a variety of avenues that go beyond appearance—like talents, personal accomplishments, the ability to make people laugh or be a good friend, and so on. Let’s challenge this narrative of bodies and confidence because we can do better. For the young girls reading this magazine and picking up these messages, we can do better.